In my book, no Christmas is complete without a festive shade on my nails. I only have two requirements: red and glitter. The nail polish I’ve been wearing this season combines both in one bottle. And guess what? The quality doesn’t disappoint either. ‘Rhubarb and Custard‘ is the first Models Own polish I’ve tried and also the first scented nail polish that touched the surface of my nails. I have to say, I was pleasantly surprised. If you’re a fan of sparkle yourself, but don’t enjoy the dreadful process of removing chunky glitter from your nails, this might be the nail polish you’ve been looking for. 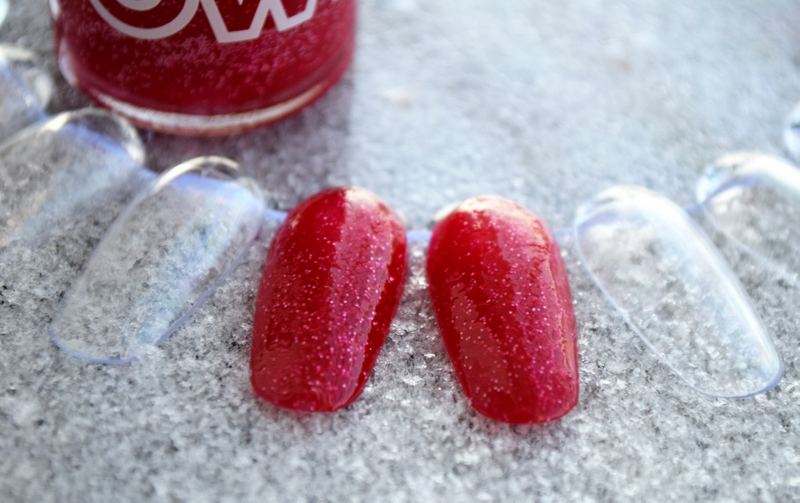 With its almost jelly-like consistency, it nicely distributes tiny slivery glitters between the red base and makes your nails look festive in a nice, subtle way, without making you pull out your hair once it’s time for the shade to say goodbye. The formula requires standard two coats for opacity, leaves no streaks behind and makes sure your nails are chip-free for at least a couple of days. As for the scent goes, the polish truly does smell like the sour candy you can see on the cap. And while I have to admit that I don’t see much point in scented nail polish, I still think it’s kind of cool. In case you’re wondering, the scent lingered on my nails for two days, even when I applied my Seche Vite top coat over it. What are your thoughts on scented nail polish? Yay or nay? Have you tried any yourself? I don’t think I’ll be the first in line once new scented releases come out, but I’ll definitely be picking up some more Models Own nail polishes, scented or not. Res super zadevica, bleščice znajo biti učasih res malce nadležne =)http://cherryfashion-k.blogspot.com/xxK. Oooh, so pretty! I also recommend the beloved China Glaze Ruby Slippers!